1982 – The Championship comes to Hilton Park following a nerve wracking 13-4 victory at Whitehaven before an estimated 4,500 Leigh fans. Leigh trail 4-1 at halftime only for Alex Murphy’s half-time team talk to lift his charges in the second half. 1985 – Leigh relegated from First Division. 1986 – Leigh romp to Second Division title. During the season, twice breaking the scoring record for most points in a game against Mansfield Marksmen (76-6) and Keighley (92-2). Centre Steve Halliwell scores a club record 49 tries during the season, while Chris Johnson romps in for 400 points. Des Drummond is selected for his record breaking 22nd International appearance. 1988 – Leigh relegated from First Division. 1989 – Second Division title secured once more. 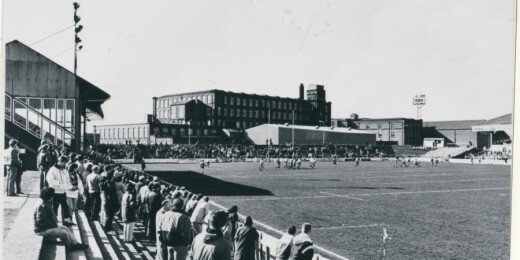 1990 – Leigh relegated from First Division. John Woods returns to the club having left in 1985. Crippling financial problems are revealed. 1991 – Player Tony Cottrell heads a consortium that takes over the club and Hilton Park is saved from the bulldozers thanks to loyal fans. Alex Murphy is sacked on the eve of the new season. Kevin Ashcroft takes over and guides the club to promotion behind Sheffield. 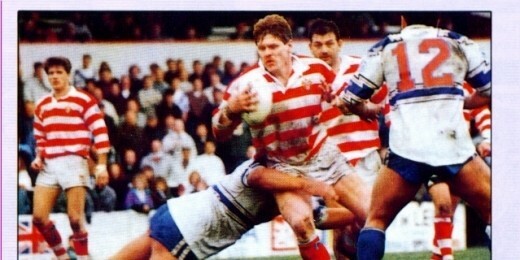 1992 – John Woods retires having broken the club’s career points record. Steve Simms is appointed as the club’s first overseas coach. St Helens inflict a new club record defeat with a whopping 64-9 win over Leigh at Knowsley Road. Leigh regain their form however with great wins at Wakefield, Hull, and Sheffield; and finish the season with excellent results at home. 1994 – memorable victories over title chasing St Helens and Bradford punctuate a difficult season and Leigh are relegated from the top division. 1997 – Leigh finish 2nd in the Second Division and are promoted. 1998 – Leigh finish bottom of the table with a succession of heavy defeats. Unknown Australian Ian Millward arrived to take the coaching reigns in October. 2000 – Ian Millward leaves for St Helens, fellow Australian Paul Terzis is appointed. Leigh make it through to the Grand Final before losing 13-12 to Dewsbury. 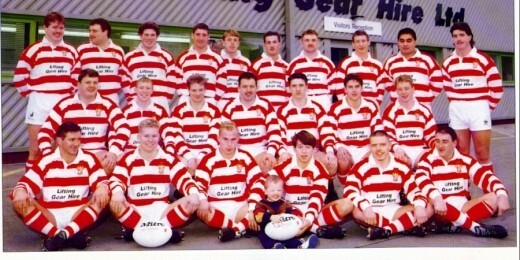 2001 – Leigh romp to Minor Premiership glory, winning 26 from 28 league games and also lift the Trans-Pennine Cup with a 36-0 drubbing of Keighley. Promotion evades Leigh however who crash to a heartbreaking 26-18 play-off defeat to Widnes. Neil Turley breaks the club record for tries in a season and also the world record for number of tries scored by a fullback. He equals the tries in a game record with 6 of the best in a 70-0 drubbing of Workington. He eventually finishes the season with 55 tries for Leigh and representative honours for Lancashire and Great Britain Under-21s. 2002 – Leigh battle gamely in the Northern Ford Premiership, finishing runners-up to rampant full-time Huddersfield. The Centurions go on to make the Grand Final and are competitive for 50 minutes before Huddersfield stretch away to take the game 38-16. Neil Turley finishes the season with 404 points – a new club record. Adam Bristow surpasses Mick Bolewskis record of 100 games for an Australian player. 2003 – A brand new season sees Leigh again tussle with full time opposition in the form of Salford. Neil Turley returns from a serious back injury to score a club record equalling 38 points in a game (5 tries, 9 goals). The club reaches the final of the Arriva Trains Cup only to lose 36-19 to Salford. Towards the end of the season Paul Terzis was sacked with Alex Murphy, Norman Turley and Tommy Martyn taking the reigns. 2004 – Darren Abram is appointed Head Coach, and finally the club achieves its ambition to play at Super League level following an emotion draining extra-time victory over Whitehaven by 32-16. Leigh also lift the Arriva Trains Cup with a 42-14 final victory over Hull Kingston Rovers. Coach Darren Abram oversees a number of big wins over the course of the season and Neil Turley scores a record 468 points and sets a new mark for goals in a season. 2005 – Leigh endure something of a horror season, their first as a fully professional club and Darren Abram leaves midway through the campaign after being in charge for the clubs only league wins of the season against London Broncos (24-22) and Wakefield (40-18). The club also draws with Hull (22-22), while Tommy Martyn and Heath Cruckshank both try their hand at the job before Kiwi Tony Benson is appointed. 2006 – Under Benson, Leigh finish third in the league and win the Northern Rail Cup in exciting fashion at Bloomfield Road against eventual League and Grand Final Champions Hull Kingston Rovers. The Centurions finish with the best defensive record but pay the price for being unable to replace Aussie kingpin Julian O’Neill who is sacked by the club in July. A loss to Batley in the play-offs signals the end of Tony Benson’s reign. 2007 – Darren Shaw was appointed in time for the season and he assembled a squad at fairly short notice. Leigh were competitive without being outstanding, save for big losses to Castleford and Widnes. Paul Rowley retired from playing after 400 professional games. The season petered out with the Centurions losing 6-19 at Whitehaven. 2008 – James Taylor was named club captain but Shaw resigned due to off field matters a couple of days after a 10-36 defeat at Featherstone ended club interest in the Northern Rail Cup. Neil Kelly was appointed Head Coach following a five game caretaker stint by Paul Rowley. Leigh win their last league game at Hilton Park 32-8 but the same opposition had their revenge, winning 30-24 with Gregg McNally scoring the last first team try on Hilton Park. Leigh move to the Leigh Sports Village in December and open the venue with a 4,600 crowd against Salford. 2009 – A disappointing start to the season sees a change in coach after seven games with Neil Kelly being handed a director’s role. Paul Rowley again steps into the breach and despite improved home form the club are relegated, despite finishing ahead of Toulouse, following a dramatic last day that brought a convincing 47-14 win over Whitehaven. Australian Ian Millward agrees to become First Team Coach for a second time. Leigh recruit Robbie Paul, Ricky Bibey, Tommy Goulden, Tim Hartley and John Duffy ahead of the 2010 campaign. At the 11th hour the club received a reprieve from relegation after Gateshead Thunder went into Administration. 2010 – The Centurions enjoyed a much improved season under Millward. The club went from second bottom of the Co-operative Championship, to second top. Leigh get knocked out of the Play Offs by Sheffield Eagles. 2011 – The Centurions go unbeaten until early June, losing to Halifax at home in the Co-operative Championship. Ultimately Leigh gain revenge by beating Halifax in the Northern Rail Cup Final, thanks to a last minute try. The club again finishes second in the Championship, with Shefield once again knocking Leigh out of the Play Offs. At the end of the season Ian Millward leaves the club to join Castleford Tigers. 2012 – Paul Rowley takes over as Head Coach and leads the club to a top two finish, however for the third consecutive year the Centurions are knocked out of the play offs by Sheffield Eagles. 2013 – The Centurions lift the Northern Rail Cup for an unprecedented fourth time with a 43 – 28 victory over Sheffield Eagles at The Shay, Halifax. The club achieved a top four finish in the Kingstone Press Championship, but were knocked out of the playoffs by Batley Bulldogs. 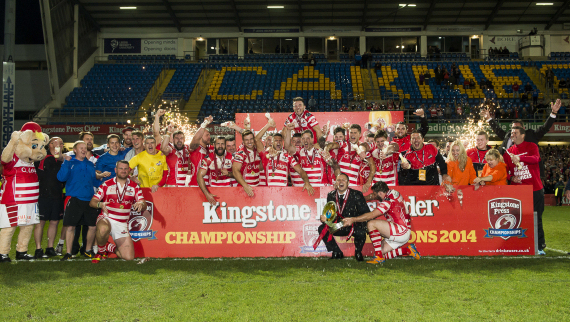 2014 – The Centurions enjoy their most successful season, results wise, of all time. The club only endures two losses all year, one against Leeds Rhinos at Headingley in the Challenge Cup, and one against Doncaster at the Keepmoat Stadium in the Championship. The Centurions claim the League Leaders Shield, and well over 1,000 points are scored over the course of the season. For the first time in a decade the Centurions find themselves in the Grand Final at Headingley, where they beat Featherstone Rovers 36-12. 2015 – It was more of the same for the Centurions in 2015, with just one league loss recorded against London Broncos. Once again a thrilling Challenge Cup run ensued, as the Centurions gained victories over Super League sides Salford Red Devils and Wakefield Trinity Wildcats, before being knocked out by Warrington Wolves. After lifting the League Leader’s Shield for a second consecutive year, the Centurions were unable to gain promotion to Super League, winning just one game in the Super 8 Qualifiers. 2016 – Paul Rowley leaves The Club a week before the season begins and is replaced by his deputy, Neil Jukes. Following a Round 1 defeat at Batley the Centurions go unbeaten until April, when they are knocked out of the Challenge Cup by Toulouse Olympique. The Centurions lift the League Leader’s Shield for a third consecutive year, and finish second in the Super 8’s Qualifiers, after beating three of the four Super League sides, Salford, Hull KR and Huddersfield to guarantee a place in Super League 2017. 2017 – The Centurions got off to a good start in the Betfred Super League scoring early wins over St Helens, Warrington and Huddersfield, but ultimately the year turned into a bit of a roller coaster ride, with a number of disappointing performances seeing them slide down the table. Late on in the regular season though, victories over Hull FC, Wigan and Salford meant that Leigh didn’t finish bottom of the pile, however with four wins out of seven in the Super 8’s Qualifiers, they found themselves in the Million Pound Game with Catalans Dragons. The Dragons pulled off a 26-10 victory, to send the Centurions back to the Championship in 2018. 2018 – Life back in the Betfred Championship began badly for the Centurions, losing five out of their first six games. Neil Jukes departed in February, with his assistant Kieron Purtill taking the reigns as Caretaker, before being appointed proper in May. The Centurions began to climb the table with an 11-game winning streak, until a loss to Toronto Wolfpack at the Summer Bash. The Centurions missed out on a place in the Super 8’s Qualifiers by just one point, at which time a number of high earning players left the Club to ease it’s financial burden. After a turbulent Betfred Championship Shield campaign, the Centurions were runners up, being beaten by Featherstone Rovers 42-10 in the final at the LD Nutrition Stadium. Following a period of uncertainty over the future of the Club, Kieron Purtill leaves to join Widnes Vikings. John Duffy is then appointed as Leigh Centurions Head Coach for 2019.